Guitar Tuning utilizes several methods which will be discussed in this session. For beginners or the untrained ear, the easiest and most accurate method is the use of an electronic guitar tuner. There are also a number of websites offering free tuning apps which can be used on all types of electronic media including tablets and mobile phones. Other forms of tuning require a device or instrument and using your ears - essential for guitarists wanting to develop and train the ear. If you want to play your guitar in any key and in any position on the fretboard - and play along with other instruments, it is essential that you tune your guitar to concert pitch. Top E (highest sounding open string), should sound the same as the note E on the keyboard - 2 notes above middle C.
P.S. Beginners - don't be discouraged if your accuracy is a little wayward... it does get easier and more accurate with practice. When using a piano or electronic keyboard to tune, some singer/guitarists tend play the note and pitch it with their voice as they are tuning the string... the choice is yours, but stick with it... you'll be glad you did. 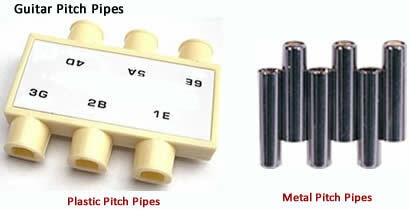 Pitch pipes are available in a variety of different materials and are a very handy device for tuning your guitar. They are ideal for beginners as they produce all 6 notes of each open string. Each pipe has a tone which corresponds to each open string on a guitar... many modern pipes have the tones marked. Simply blow each pipe and tune each string accordingly. For any guitarist that wants to play in tune every time, an electronic tuner is an absolute 'must'. Tuning a guitar using any of the above methods requires a good ear. Some ears are better than others and you often find that 2 people can tune their guitars only to find that they are slightly out with each other. For extreme accuracy, using your ear to tune a guitar is a highly specialized skill, one which you will develop with years of experience. If you are a beginner or novice and want your guitar to sound the best it can every time you play, an electronic tuner is highly recommended. If you do prefer to tune your guitar by ear, an electronic tuner still comes in very handy for determining a reference note to tune the rest of your strings and ensure concert pitch. It is also a great tool for checking the accuracy of your tuning. This is a traditional form of tuning which tunes the guitar to itself. It uses a single reference tone and your ears to tune your guitar, ensuring that the strings are all tuned in relation to each other. It is a method that should be used by all guitarists as it helps to train the ear - the more you play the better your pitch will develop and improve. Tune the bottom E or 6th string (fattest string) to the correct pitch. Adjust the tuning key on the 5th string so that the note of the open string sounds the same as the note produced on the 5th fret of the 6th string. Adjust the tuning key on the 4th string so that the note of the open string sounds the same as the note produced on the 5th fret of the 5th string. Adjust the tuning key on the 3rd string so that the note of the open string sounds the same as the note produced on the 5th fret of the 4th string. Adjust the tuning key on the 2nd string so that the note of the open string sounds the same as the note produced on the 4th fret of the 3rd string. Adjust the tuning key on the first string so that the note of the open string sounds the same as the note produced on the 5th fret of the 2nd string. P.S. If you are playing along with other types of instruments and you want your guitar to be tuned to standard concert pitch, it is important that you have an accurate reference note, preferably bottom E - otherwise your guitar will be out of tune with the rest of the instruments. 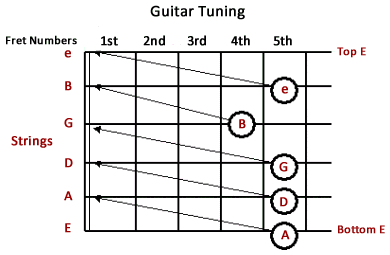 If you don't have a tuning device, a well tuned piano or keyboard is the easiest way, as you can determine the correct pitch in the right octave... see diagram 1 for guitar tuning using a piano or keyboard. If you are playing alone or with other guitarists and don't have a device or other instrument to give you an accurate reference note, as long as you all have the same pitched bottom E (or thereabouts), you are 'good to go' using this method... it may not be in standard concert pitch but at least you will be in tune with each other. For greater accuracy however, concert pitch is always preferred. Top E and Bottom E are the same note but 2 octaves apart, so when you have finished tuning, play the Bottom E then the top E... although one sounds higher than the other, you can tell they are the same note. If they don't sound like the same note, you may have to check each string again. It is sometimes a good idea to do a quick tune, then do a second more accurate fine tune. Use the tuning heads to bring the string you are tuning, up to pitch - not down to pitch. This is done by loosening the string so that it is slightly flat, and then bring it up to the correct pitch. String slippage is prevented by fitting the strings correctly. After stringing the guitar, make sure you stretch the strings by pulling, hitting, bending etc., and 'playing them in'. If you are a lead guitarist who uses light-gauge strings and bends them frequently during solos, you may find yourself having to re-tune your guitar more often than an acoustic player using heavy-gauge strings with a lighter playing technique. Strings tend to go out of tune with sudden temperature variations, e.g., taking your guitar from a cold room to a warm room or vice versa. Try and avoid these situations whenever possible - if they are unavoidable, make sure you re-check your tuning.